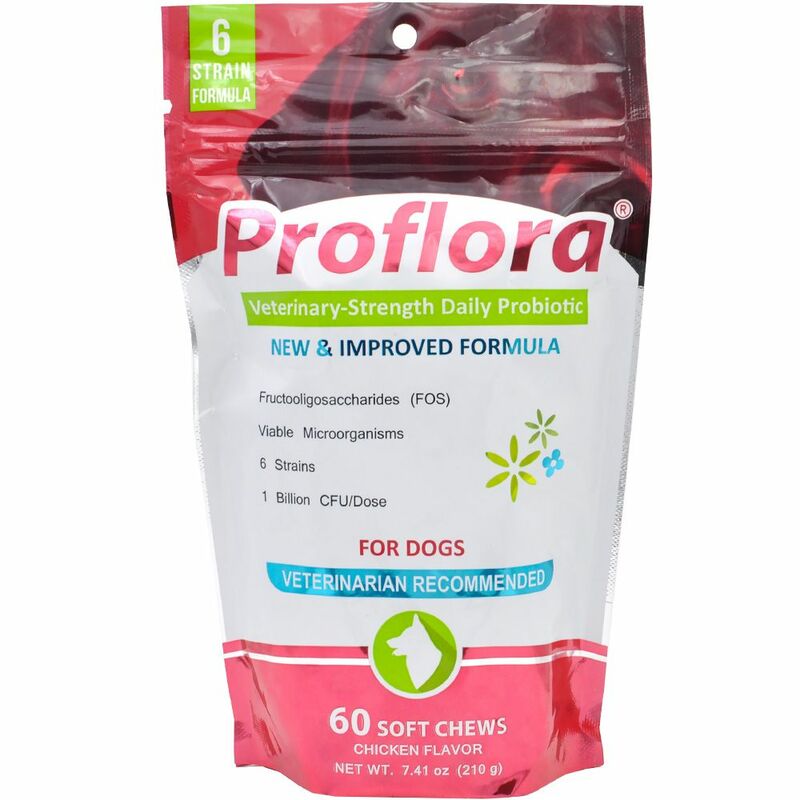 Proflora™ veterinary-strength probiotic soft chews for dogs help support digestion and overall canine health. For daily use. Proflora helps maintain a healthy probiotic balance in the digestive system. 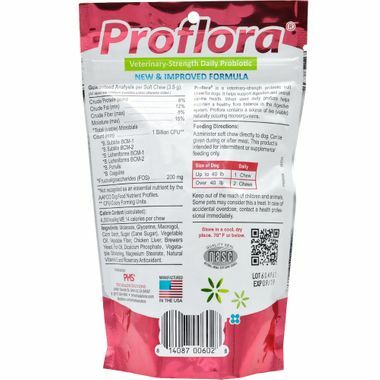 Use Proflora to re-balance the microflora population in your dog's GI tract. Contains 6 strains of live (viable) microorganisms and 1 billion CFUs per serving. There are many ways the balance of good verses bad bacteria in the GI tract can become imbalanced, diet, stress, medications, and especially antibiotics are just a few of the ways. Having an unbalanced intestinal microflora or no microflora in the intestine(after antibiotics) can lead to multiple problems; gas, runny stool, constipation, scooting, difficulty digesting, inability to absorb nutrients, stomach cramps, and can even lead to other problems like low immune system and unhealthy skin and coat, even bad breath. Using the 6 strains of live (viable) beneficial bacteria in Proflora on a daily basis helps repopulate the GI tract with beneficial bacteria and assist in digestion. Proflora comes complete with FOS, a non-digestable prebiotic that acts as food for the probiotics. 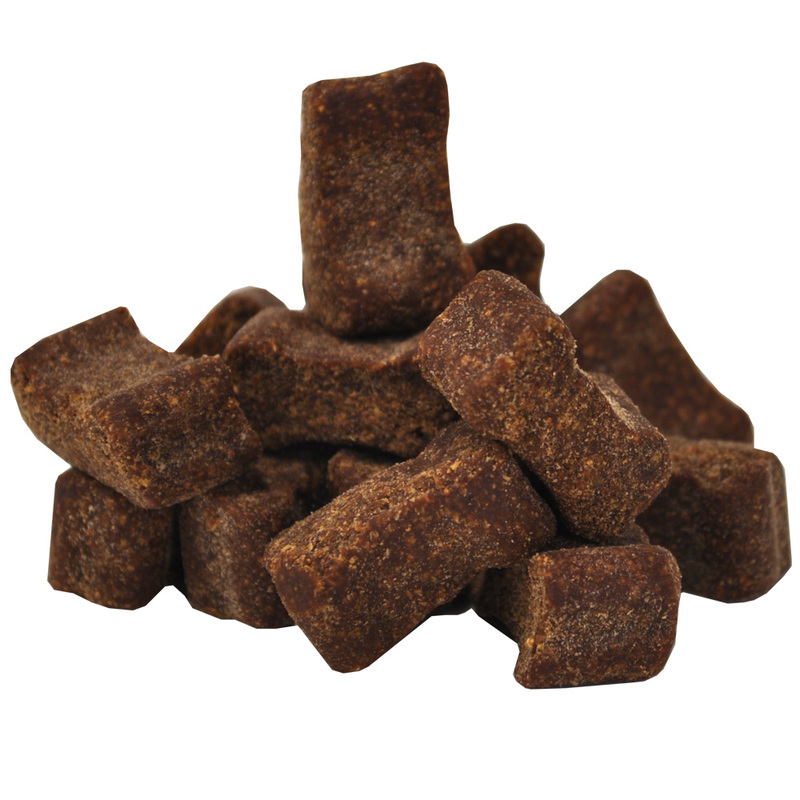 Proflora Probotic Soft Chews are a tasty natural chicken flavor that your dog will love eating and they will in turn help support your dog's digestive system health and function. These probiotic supplements are a great way to ensure good health. Ingredients: Molasses, Glycerine, Macrogol, Corn Starch, Sugar (Cane Sugar), Vegetable Oil, Vegetable Fiber, Chicken Liver, Brewers Yeast, Fish Oil, Dicalcium Phosphate, Vegetable Shortening, Magnesium Stearate, Natural Vitamin E, and Rosemary Antioxidant. Administer Soft chew directly to dog. Can be given during or after meal. This product is intended for intermittent or supplemental feeding only. The product is great, but I never received my last order. Your online Chat was not helpful and when I emailed you about not receiving my order, it took you a week to reply. I had to order the product from a competitor. ConsYour customer service was basically non-existent. My dog is not eating grass and throwing up as much as he used to But, he doesn't like them. I have to crush the chews and hide them in food. I think I will try the capsules.